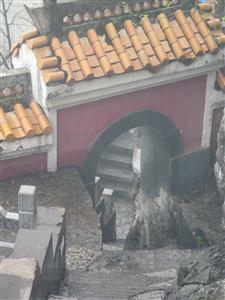 Well, i'm off to wing it in China for a while, there is some structure to my plans i'm just not sure what they are yet! Thats not entirely true, i'm hopeing to do a bit of teaching somwhere whilst i'm out there and i fully intend to land in a plane in Hong Kong, see i've got loads of plans!!! note: the name has changed again, for the last time i promise! My flight is tomorrow and i haven't packed yet so i'm off! So I got to HK safe and sound and met H and J too which was ace, we've been bombing it around for the past couple of days which has been good cos it got me knackered so I haven't suffered too much with Jet Lag. Got my Chinese visa yesterday shortly after visiting the worlds biggest sitting down brass outdoor Buddha which was good despite all the conditions to its fame! I also bought a camera, proper nice one for 90 quid including a 1 gig card which is rather excellent, the ridiculous amount of high tech shops here is somewhat daunting and you haggle almost everywhere even in the department stores. However Hong Kong is EXPENSIVE, it's like I never left home, its a pretty cool place and the high rises are impressive but I couldn't stay here for much longer than 3 or 4 days there's not a massive amount you can do on a budget so I'm getting a train to the mainland tomorrow to immerse myself in the ridiculously cheapness of China. Helen and Jamie fly home tonight so I'm properly on my own from here on out, pretty exciting actually! Despite the cost Hong Kong was a great decision, it was a gentle introduction into China with its bilingual signs and super efficient underground system. I was prepared for anything in HK and the city didn't dissapoint. The mixture of cultures was a big surpirise the majority of faces where Chinese on the underground but as I entered the HK streets for the first time in kowloon (the other side of the water from Hong Kong central) it was west african and central asian faces and voices everywhere. We (Helen Jamie and I) where staying in Chungking mansions a bizzare, scruffy building that once inside resembled some sort of space port market thing, its hard to explain but all the bussel was exciting, being gently harrased for cheap suits and fake watches every time you entered and exited just added to the charm. You would think this sort of establishment would be cheap and i suppose by Hing Kong standards it was but by asian standards it certainly wasn't $15 to the pound, our room was 80 each for the smallest triple i had ever seen. Even fruit from the market downstairs was dear. I was in the city for 4 days most of the time spent with H & J and they kept me busy whizzing us around to the sights. We went up the monorail to the Victoria peak viewpoint which was spectacular despite the persistant haze. The walk back was also great HK is surprisingly green in places despite the enormous towers which seem to crop up impossibly from the tiny island. Other trips involved trawling through colourful markets mostly full of tat and a boat trip to Lantou Island, a strange place 3 times the size of HK island and much less developed it was here we visited the sitting brass buddah. Downtown Hong Kong is spectacular, having not been to a city with highrises before i was taken a back by the awesome office blocks and financial buildings. Sadly i was still cameraless at this stage so missed a few good photo ops. 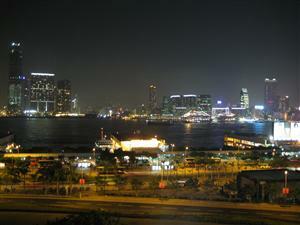 Kowloon at night across the south China sea, from Hong Kong island. Its when your in the central area of Hong Kong that the true reason for this city reveals itself, the place is like a financial hub with the other bits a similarly important financial city would have missing. Its clear that the British rule HK was under and lack of restraints it then gained molded this city onto an abnormal place in comparrison to the rest of Asia. Its hear that your wallet takes the biggent beating too especially if you want to have a drink with alcohol a minimum of $50 a bottle in bars, often up to twice that. H & J flew home wednesday evening, i was sorry to see them go as the last year without them back in britain had been strange. I then paid $120 for my single room and prepaired myself for my lone trip to the mainland. 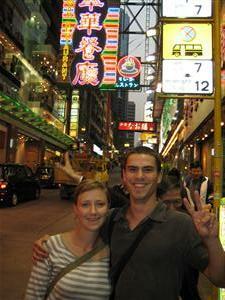 Armed with my shiny new chinese visa i headed to Hong Kong station to catch a train to the mainland. I knew that the surrounding area of China was still expensive and also very poluted so i wanted to get in land a distance. $130 took me the 2 hour trip to Guangzhou a smog belching industrial hub and one of Chinas massive cities. From here i intended to catch a sleeper train that evening to Guiln 13 hours North West. After passing through customs and changing my HK$ for Yuan I am heartily greated by a couple of "tourist information" gents. They ask where i am going... i tell them (mistake). I'm pretty sure, despite what limited travelling experience i have had, i should now not to talk to touts by now, its strange you get yourself ready to act tough and then answer there first question without thinking! Surpisingly enough they where full of crap as i was told i would not be able to get a train until tomorrow, that i couldn't buy tickets from this station and that they would book it for me at the "same price" of 1700. As soon as he said that I bailed, my lonely planet said you could by them downstairs and it should cost around 200. I legged it down the closest stairs into the ticketing section of the station, I eventually located the long distance checkouts and was greated by a chinese computerised board of destinations. A bit stuck i asked around and eventually determined which large line i should join, 20 minutes later i was at the front but was greated by a blank face when i asked for my ticket. I was then directed to another que with an english speaking clerk and was allowed to jump to the front, i was quickly sold a ticket and paid 209 yuan... travellers 1, touts 0. "no no it very long way, 100"
We settled on 60 and then i bailed and joined the que anyway, that bemused him and he followed me for a while before scuttling off. I got a regular cab it cost 25. The main station is enormous, apparantly one of the biggest in China, there must have been 5000 folk outside some of which looked like they had been there for days, many of those faces looked Mongolian so i guess they where a long way from home too. 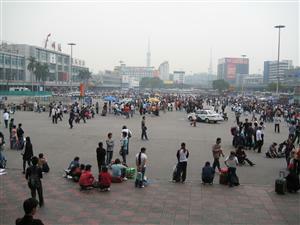 Guangzhou station, the station is in the far left, with all the folk outside! I had 4 hours before my train left and the left luggage department looked chaotic so i decided to hang around, I took a picture then noticed all the police and remebered the stories about people getting arrested for taking pics of important buildings so i put my camera away. Eventually i ventured inside armed with my 1 yuan (7p) pot noodles as recomended. Finding where to wait wasn't too difficult as i now knew my train code (in english letters and numerals) so you just follow the signs to your designated waiting area. Around 20 minutes before the train was due to depart there was a shout and the whole waiting room rose and stormed off. I followed the throng assuming that there had been a change of platform, that was the case and we stepped out onto the platform. As i entered my carriage the situation changed dramatically from the organised chaos of the staion I entered the calm, clean and orderly haven of the train. Greated by a ticket lady assigned specifically to my carriage i swapped my ticket for a card with my bed number on it. I find my bunk, take off my shoes and scramble onto my slightly small but comfortable bed. There are 3 beds on each side of our little bay with cotton sheets, pillow and quilt covers. We also have our own supply of boiled water. We get our own tea lady too who sells fruit and plated meals. I tuck into my deluxe pot noodle and drink some green tea. The pan pipe moods music isn't great but my earplugs are to hand so no worries there. The bumpy train pulls off and I settle for the night, leaving the polution behind. My train arrived at dawn and i was concerned that the the hostel wouldn't be open. I wonder out the station completely ignoring the taxi touts who are nothing like as bad as suggested in Lonely Planet! Helens directions for the hostel are a big help and i'm in my dorm for 7am, also bore the firt fruit of my YHA membership a whole 5 Yuan off! Its quite chilly here so my jumper and jeans are back on. I'm still really tired, didnt sleep much on the bumpy train, so i'm just gonna chill out in the comfy hostel today. 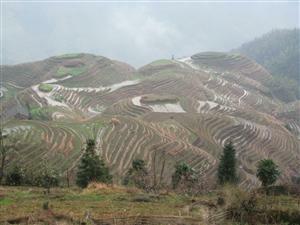 WIll head into Guilin this evening and tomorrow, then onto the river cruise. Guilin was wet, the first day i was there was a write off and anyway i was knackered from my train trip so i just recouped in the hostel common room reading my book and watching CCTV9 the english language chinese telly channel. I ventured out in the evening for my dinner, yet to get my courage up regarding street food so i headed for a restaurant recommended by Helen and the lonely planet. It was ace 2 dishes rice and beer for 40 yuan. To be honest i ordered too much food, i keep thinking because stuff is so cheep that you need to order a couple of plates else there wont be enough, half an enormous bowl of green beans and a fair chunk of szechuan pork later i discovered i was wrong! I had all Guilin's landmarks pencilled in for the next day and after a solid nights sleep i head out into the city, its overcast but fresh. I found my first destination "solitary beauty peak" an old princes place and gardens with a hill at the back of it from which you could get great views of the city. I paid my 50 yuan and the heavens opened. 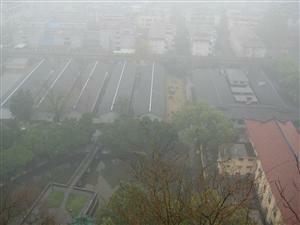 The main Palace, thats the hill in the fog behind! I ventured on looking in the little museum which promisingly had an english introduction but as soon as you entered became a solely chinese affair,, its fair enough i suppose its just nice to know what your looking at. I wondered to the peak and up the steep steps the view at the top was non existent as the rain had wiped out any scenery behind a dense grey blob. The not so good view down from the top. Straight ahead was grey! There was a smattering of Chinese tourist around all sensibly armed with brollies and as i headed out the park the rain got heavier and the streets cleared. I was going to go to the main park which contained 7 more similar peaks but i sacked it off a trudged back to the hostel. The afternoon followed that pattern of the previous as i read some more of my book whilst keeping an eye on the ridiculously clipped tones of the chinese news presenters. Next morning I jumped on the bus to Yuangshou a village about 80 km south that apparently contains some of Chinas most dramatic scenery, hopefully i will be able to see it! The weather here started bad too but it doesn't take away from the scenery. Yangshuo is a fairly small town very popular with tourists there's a whole section of the town devoted to them but its not too bad quite noisy and comparatively expensive but its nice and relaxed. I had planned to do a hike on my first day here but the weather was dreadful so i jumped on a bus to my destination instead. The little fishing village of xingping, it was suggested in the lonely planet for its old town, which was tiny , but certainly worth a look, everything you would expect from a stereotypical old chinese town, rows of small houses with lanterns hanging down and bicycles strewn in the street. It was nice to wonder around and i was the only western tourist there, the chinese tours where present too but they seemed more interested in getting the extortionate ferry trips. 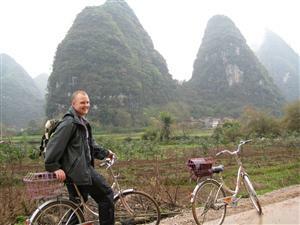 I had intended on getting a boat back down the Li river but it was too expensive to hire one alone so i got the bus back instead. Its definitely the main problem with being a single traveller, trying to get on tours and certain modes of transport can be really worthwhile if there is 3 or 4 of you but its just not viable if your alone. Can be a bit frustrating. 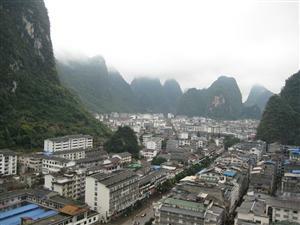 Yangshuo is famous for its scenery, in particular the karst peaks. The best way to see them is to hire a bike and venture out. On my second day i joined with a chinese speaking malaysian and we both hired bikes for the day and headed out. The route should apparently have taken us about 3 hours but it stretched out to 6 due to a combination of photo stops a shoddy map and 2 punctures, neither of which i suffered i'm glad to say. The scenery is spectacular (i'll post up some pics when i've got a slightly quicker computer) The mountains rise from nowhere like big green teeth. They look like the kind of hills you draw when your a kid, ridiculous rounded lumps with vertical sides. Was walking through the touristy part of town that evening in search of some dinner when i bumped into a chap from uni, wound up having dinner with him and the rest of his tour group which was ace! They where in town for a couple of days as part of a whistle stop tour of China. Dan complete with pink ladies bike and crazy hills! Getting a bus back north tomorrow morning so im off to bed. 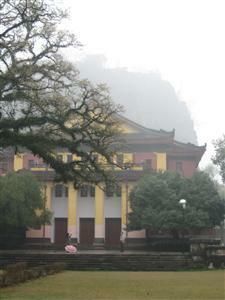 I got the bus from Yangshuo on yet another wet day in China. I took 3 buses actually over several hours but it was well worth the effort to get to the old chinese village of Ping 'an. As the bus closed in on our destination up a winding mountain road we entered a bank of clouds and I cursed my luck again thinking that my trip all this way would be wasted. I was dropped off at the village gate and was still in the cloud. Ping ‘an’s centre, where I would be staying in one of its many guest houses, was about 20 minutes walk up the hill. So flanked by prospective landladies I trudged up the steps. The place looked surreal shrouded in cloud, the strange, gravity defying, traditional dong style houses looming out of the mists. However as I reached my selected guesthouse I also got above the clouds so I now found myself in an ancient chinese village that looked a bit like it was floating in the sky. 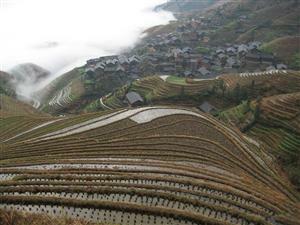 The area is famous for its rice terraces first cultivated in the 14th century they follow the contours of the hills, up to altitudes of around 1300 meters, seemingly endlessly. 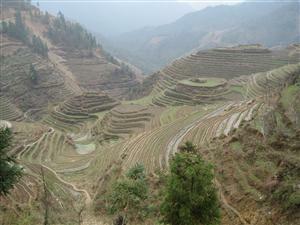 All of the fields are still in use so there are funky bits of bamboo irrigation system dotted about the place too. I had set aside the nest day to walk amongst them. So next morning I set out on my walk, I intended to head away from the touristy area (there were a ridiculous number of chinese tourists here too) and walk to the next village along the ridge. The other reason to get off the main tourist route was to get away from the particularly persistent local tribal woman who were insistent that I should photo them with there apparently Guinness world record breakingly long hair. Once onto the path to the next village I was completely alone and didn't see a sole for the next 3 hours, it was ace you’d walk through a bit of pine and bamboo forest turn a corner and be greeted by yet more ridiculously engineered fields. The effort the went into the original creation of these things must have been immense. One of the famous bits, "7 stars acompany the moon"
I reached the village and then headed back to my hotel, there was a round walk but it involved another 3 or 4 hours of my time and there were rumblings of thunder around me. The weather had been kind up to then, a nice fresh breeze to walk in but it didn't take long to change the well trodden paths turned to streams in moments as it began to poor down and I was soaked despite my best efforts to leg it back to the hotel. Was well worth the drenching though, the highlight of my trip so far! The storm worsened and continued all night but by the morning it had passed and the weather was glorious, just in time for me to catch my bus out of there! Its sunny and warm here, first real blue sky since I've been in China. The streets are busy too, its as though the population has doubled. 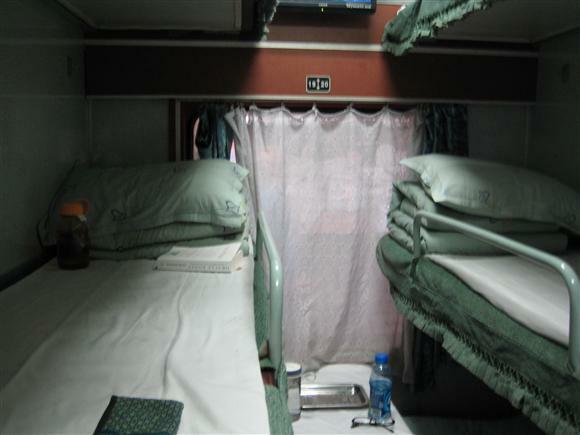 Just bought my train ticket to Kunming which went with no hitches. Not much to do now till my train tomorrow, went to the sichuan restaurant again last night, had eel, was very nice! Just arrived in Kunming, 1265km and around 18 hours on the train. The train trip was fun i was in a bay with 6 middle aged women who kept giving me bananas and laughing at me when i tried to climb into my bunk which needless to say i'm a bit to big for. They also had a water bottle with sand and 2 or 3 tiny crabs in which they looked after really carefully for the whole trip, most odd. Arrived in Kunming at midday and jumped in a cab after deciding against the slightly vague bus directions lonely planet has in the book. The taxi driver was ace, he got lost too and i sat there for 15 minutes while he rang up the hostel to figure out where to go, he also spoke no english and had decided i was trying to find somewhere to eat not sleep but lots of frantic pointing at characters soon sorted that out. He cheerily drove on finding the hostel after an epic 30 minute drive through the city. I haven't mentioned how mental the driving is yet have I, i'm sure you can imagine. We got to the hostel and i tried to tip the chap but he wouldn't have it and gave me a discount instead... legend! The hostel is really nice and chilled I can imagine it being a bit of a hippy haven if it where really busy but there doesn't seem to be to many people here. 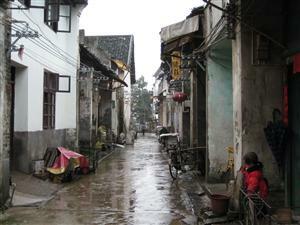 Will be checking out Kunming over the next couple of days so i'll report back soon.